The Arena of Valor International Championship (AIC) 2018 moves on to the playoffs stages, kicking-off with the quarterfinals matches on December 8 to 9, 2018. 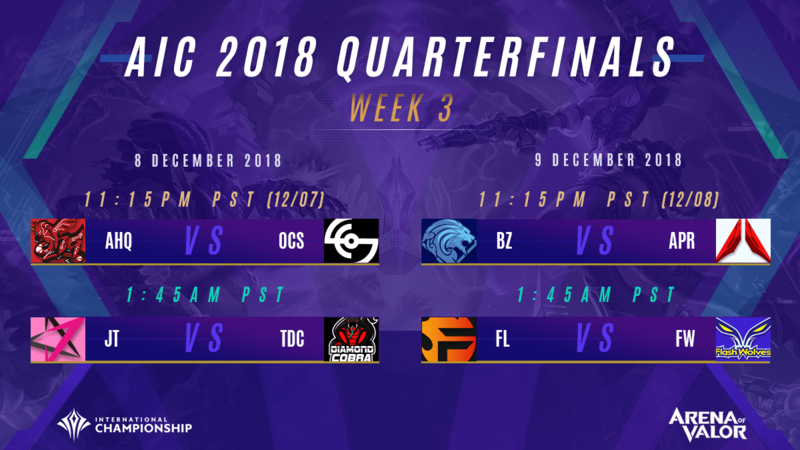 The Arena of Valor International Championship (AIC) 2018 quarterfinals is scheduled to run on December 8 to 9, 2018. After a series of grueling matches filled with spectacular triumphs and devastating heartbreaks, only 8 teams remain to lay claim to the international title and a shot at the $600,000 USD prize pool. The seed teams from South Korea (ahq e-Sports), Thailand (Bazaar Gaming), J Team (Taiwan) and Vietnam (Team Flash) have all made it to the quarterfinals to face their respective opponents in a single elimination format. On Saturday (December 8), Ahq e-Sports from South Korea is set to take on Overclockers from Vietnam, while Taiwan’s J Team will go head-to-head with Thailand’s Toyota Diamond Cobra. Sunday (December 9) will pit Thailand teams Bazaar Gaming and ALPHA Red against each other, while Vietnam’s Team Flash will duke it out with Taiwan’s Flash Wolves afterwards.